On the one hand, I like bottle fillers. What a civilized way to encourage people to reuse their water bottles and to keep people from buying more bottles! Here is the bottle-filler station in the new terminal at San Francisco Airport. It's great if you have an empty water bottle on hand. But if you don't? Try sticking your mouth under that tap. It's unpleasant. You will get water all over your face. I speak from experience. The problem with bottle filler stations is that they presume you have toted your own water bottle all over town. But the whole point of a drinking fountain network is that you don't have to carry anything. When a city provides the right amount of drinking fountains, you can trust that there will be water when you need it. You don't have to schlepp canteens around with you like a desert nomad, unsure if there will be another water source before you die of dehydration. In any advanced urban development, water flows plentifully through pipes under every street. What a sad state of affairs to be so untrusting of your surroundings that you have to carry your own water with you wherever you go! San Francisco has replaced several urban drinking fountains with "hydration stations. I think it's a shame. This hybrid drinking fountain/bottle filler below, made by Elkay, is a much better solution. I'm a huge fan of these. Many outdoor drinking fountains have also jug fillers on the sides, which could easily be modified to look more inviting for bottle filling. I've seen the combo one before, once. 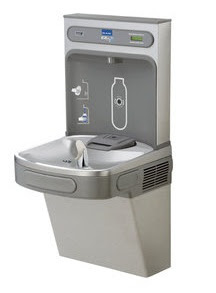 I do appreciate the bottle only form too, but if it's replacing a traditional water fountain I suppose it's more disappointing than poorly negative that it happens.